With pretty much any home-related service, there are all kinds of myths and falsehoods that are commonly propagated among the public. Some of these are insidious — deceptions that are fabricated by companies to unjustly wring money out of homeowners. Other myths are mostly benign, being born from simple ignorance. 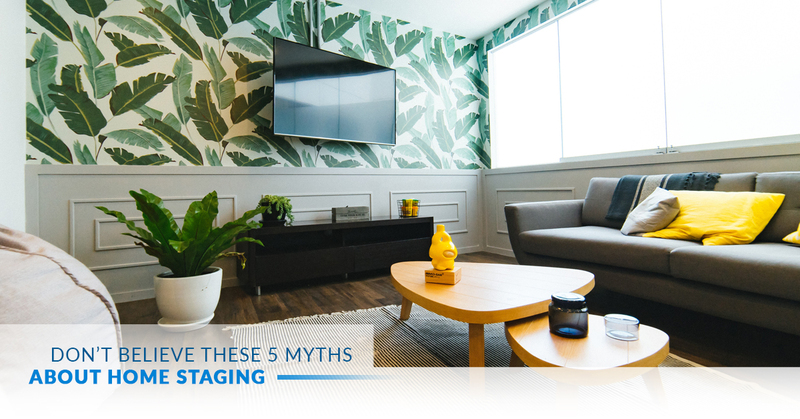 But regardless of their nature, there are plenty of myths to go around, and this is especially true when it comes to home staging! Home staging is a complex process in which one prepares to get their home ready to sell. And with all the factors (and money) that go into a successful real estate transaction, it’s important to be as informed as possible! In fact, not being aware of some of these myths can actually cost you money, whether you’re spending more out of pocket, or getting less when you sell. Here are some home staging myths you shouldn’t buy into! This is true, but only from a certain point of view. Theoretically, is it possible to sell your home without properly staging it? Of course — that is, as long as you’re okay with not getting a good value out of the transaction. However, that’s a factor that tends to be important to people when you’re dealing with hundreds of thousands of dollars. Any home will sell, no matter what condition it’s in, as long as you’re willing to go low enough with the price. But that’s not the goal with selling your home — you’re quite often able to get more out of your home than you bought it for, so why wouldn’t you utilize every opportunity to increase its value in the eyes of your potential buyers? By staging your home, you’re doing everything in your power to make it an appealing product. You’d be amazed at how far presentation goes in making your home an attractive purchase, so don’t waste the opportunity to make it as pretty as possible. To many people home staging is little more than moving furniture around and making things look nice. We’ll get to that myth later, but for now, it suffices to say that this seems like a superfluous cost to homeowners. The important thing to remember about these types of expenses is that they are, for lack of better words, an investment. By making your home more appealing, you’re directly having an effect on the amount that buyers will be willing to spend on it. In general, the money you spend is proportional to the extra money you’ll earn when all is said and done — the more you spend, the more you’ll sell it for. A savvy real estate agent will be able to ensure that these costs convert into profits — and at a margin that’s better than what you would have gotten without the extra work. And finally, it depends on the company. At IntExt Staging, we strategically price our services to be competitive to the people in the Bellevue and Redmond area, so you won’t have to hesitate on purchasing this crucial service. It’s easy to have the perception that home stagers are just glorified declutterers — that they do little more than move objects around and pick stuff up the floor until your house looks nice. In reality, there is much more to home staging than meets the eye. Did you know that interior design has an impact on one’s mood and general state of mind? The effects of interior design on the subconscious mind are well-documented and have shown time and time again that different decorating styles and colors affect people in different ways. For a simple example, consider the color black. Black is a nice complementary tone, but when a room is entirely black from floor to ceiling, it creates a claustrophobic feeling which makes the room feel smaller. White, on the other hand, tends to have the opposite effect — a fully white room feels larger to the average person. Now, just think — would a home buyer want to purchase a bigger house, or a smaller one? While the square footage is the same in the end, the point is that they will spend more if they feel like the home is big. This is one tiny example, but there are countless more which demonstrate the importance of having a team of home stagers who know the subconscious “rules” of interior design, and how to make a home look appealing. False! The reality is that the majority of home staging jobs are done in houses that are still being occupied by their owners. You can’t just live on the streets while you try to sell your home, so it’s important for home staging to be done in a way that allows the homeowners to realistically carry out their lives. This, again, is one reason why it’s a good idea to consider a professional home staging company for the job. At IntExt Staging, extensive training and hundreds of jobs have taught us well how to make a house look pristine and presentable, while still preserving all the elements that are necessary for people to live comfortably at home. We arrange furniture in a way that is beautiful and functional, and we help with organization so that you always have access to the daily essentials. Most importantly, we arrange your home in such a way to where every room is functional. Indeed, many homeowners who take staging into their hands sacrifice the usability of one room for the presentation of another. It’s easy, for example, to dump a bunch of junk into a walk-in closet to tidy up a room — but then all you’ve done is create a closet that needs to be cleaned. A professional touch can fundamentally reorganize the home in a way to where every space has functionality. Many people are naturally attuned to interior design, or have friends, families, or professional acquaintances who they trust to do decorating for them. This is all well and good — after all, we did mention how a well-decorated home has a subconscious effect on our contentment!But, there’s a fundamental difference between decorating and home staging — decorating is done to the preference of the homeowner, while staging is done explicitly for a broad “public” audience. It’s a small distinction, but an important one. One man’s trash is another man’s treasure, but that phrase works the other way around too. Homeowners decorate their space to appeal to their own personal tastes. They might prefer a specific color palette, a motif (such as rooms with a special theme, like beaches or movies), and various unorthodox decorations. This isn’t a bad thing on its own — many interior designers go with aggressively unique layouts — but it’s not good if your goal is to appeal to as many people as possible. If you live in Bellevue, or other surrounding areas such as Redmond, Issaquah, and Seattle, you’ll know that the housing market is very competitive. Washington is becoming more populous by the day, and you can bet that you’ll have eyes on your home if you go through the process of preparing it well! That’s where we come in. We’ll work with you to create a custom-tailored situation which will make your home as attractive as possible to potential buyers. Contact us today to get started!